Lot of people get misguided into buying Unit Linked Insurance Policy (ULIPs) by insurance agents. I happened to read the application form of a person who recently applied for HDFC SL ProGrowth Flexi Plan. Reading that, I wondered if I could come up with a better plan than this ULIP plan – with better returns and better insurance cover. First let me give a brief introduction about the person. He is a 41-year-old male living a few streets down from my home. He has his own fruits shop in the Koyembedu Wholesale Market Complex (the largest in Asia). He is a healthy person, married and has a 7-year-old kid. His income is about Rs. 800,000 per year everything from his business. His policy is for 10 years with a cover of Rs. 600,000 with his kid as the nominee. For this he pays a monthly premium of Rs. 5000 (Rs. 60000 per year). End of 10 years he would have paid Rs. 600,000 as his premium with a life coverage of just Rs. 600,000. Since this is a unit linked policy, if the market performs better, his fund value and his investment also increases. But by how much? The insurance companies need to show a projected statement of premium, fund value, death benefits, etc., for 4% and 8% returns. If he dies anytime when his policy is valid, his son would minimum Rs.600,000. No problem with that. Lets look for the most likely scenario – he lives through the term of the insurance and after 10 years gets back his investment. At 4% return he would get back Rs. 623,135 and at 8% rate he would get back Rs. 764,405 after 10 years. Lets take the higher 8% as our calculation from here on. So he earns Rs. 164,405 extra from an investment of Rs. 600,000 over 10 years. But that looks a bit low isn’t it? Can we do better? I am assuming he wants to invest the same money (Rs. 600,000) for about same number of years (at least 10 years) and get same insurance cover (minimum Rs. 600,000). There are two parts to this investment. Part of the money needs to be for insuring his family/son against his sudden death. The remaining money can be invested in some other instrument. Remember, he might have applied for this ULIP to get tax benefit under the section 80C. So our proposed investment should also get benefits under 80C. First, he should take a term insurance to protect his family in case of his death. Using HDFC Life’s Click2Protect calculator, for an insurance policy cover of Rs. 10,00,000 (the minimum available) and 10 years, he has to pay a premium of just Rs. 2980/year. Lets round it up to Rs. 3000 for easy calculation. This is the amount he needs to pay for just insurance and he gets extra cover of Rs. 400,000 than the ULIP. I would suggest he go for at least 15-20 years as his son would’ve just joined college (at age 17) when the policy term completes. If he dies at year 11 (age 52), his family would have no income as the kid hasn’t yet started earning. Increasing the term to 20 years would just increase the premium by extra Rs. 900 only (Rs. 3880). But just for the sake of comparison with the ULIP let’s go with the 10 years policy of Rs. 10,00,000. Remaining money to invest: Rs. 57000/year. There are many forms of investment under 80C, like PPF, Home loan principal repayment, National Savings Certificate, ELSS mutual fund, etc. Let me just take two of such investments. One is the most safest and the other will be investing in equities (just like the ULIP scheme). Lets see how they compare against ULIP. This is the most safest and best investment if you want assured returns. An individual can invest a maximum of Rs. 100,000 per year in it. He needs to be invested for minimum 15 years. However the minimum deposit needed to keep the account active is just Rs. 500. So lets assume he invests all Rs. 57,000 in PPF for 10 years and from year 11-15 he deposits just Rs. 500 to keep the account active. He can make monthly deposits of Rs. 4750 and his PPF account keeps accumulating all the money. How much do you think the money grows to, if he puts in Rs. 57,000 per year till 10 years at the current rate of 8.7%? At the end of 10 years he would have Rs. 927,966 and if he just keeps putting in the minimum deposit for 5 more years, at the end of year 15 he would have a cool Rs. 1,411,484. What? 14 lakhs? That is more than double his investment, in fact Rs. 811,484 more than the Rs. 572,500 he puts in. ELSS or Equity Linked Savings Scheme puts your money in the stock market and the government gives 80C benefits for money put in this scheme. 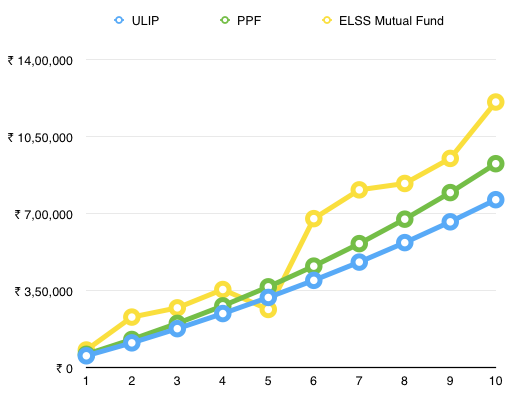 Lots of mutual funds have ELSS schemes and while not everyone is good, there are some better performing schemes also. It is locked in for 3 years and since long-term capital gains in Equities aren’t taxable, any money he takes out after the lock-in period is totally tax-free. I know it is not fair to do an investment just based on previous fund performance, but we can’t predict the markets to do a future performance calculation too. So let me take a fund which has been in existence for at least 10 years and lets see how much a monthly investment of Rs. 4750 would’ve grown. I chose ICICI Prudential Tax plan and the investment was from April 1, 2004 to March 1, 2014. We stayed on this scheme throughout the bull and bear markets. This is just for a comparison and the performance might not be sustainable in the future and this isn’t a recommendation for this fund/scheme. See how much it would’ve grown in 10 years? Rs. 1,208,195. Rs. 12 lakhs in 10 years. Which is significantly more than what he would’ve got in PPF (remember it was just Rs. 9.27 lakh in 10 years). Even more interesting is, how it is phenomenally more than what he would’ve got if invested in the ULIP’s feeble 8% rate. Plus ELSS has the lowest lock-in period of just 3 years among all 80C investments. Even assuming that ULIP gives better than the 8% rate, lot of the initial money he invested goes into managing the fund, agent’s fees, etc. But direct investment into ELSS means no such losses and all his money is invested under his name. So it’s returns will be definitely less than you investing directly in other mutual funds. How does all three options stack up? At the end of year 10, his investment in the three options will have grown to Rs. 7,64,405 in ULIP vs Rs. 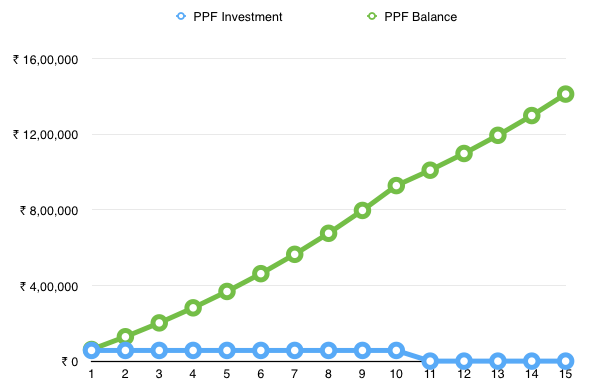 9,27,966 in PPF vs Rs. 12,08,195 in ELSS Mutual Fund (based on past performance). Even if we add 1 or 2 lakhs to ULIP because the markets might have performed well, it would be definitely lower than investing on your own. What if he dies before 10 years? Now lets see what happens if he dies before the term completes – for example, on the last month of his 10th year into the policy/investment. From seeing the official illustration of the ULIP application, I see that on death the nominee gets back just the insured amount, in this case Rs. 600,000. If he happens to die on year 9 the payout is Rs. 663,886 and on year 10 is Rs. 764,405 if the fund performs at 8%. His family doesn’t get anything more than that. If he had invested as suggested above, his insurance is separated from his investment. So on death his insurance company will pay Rs. 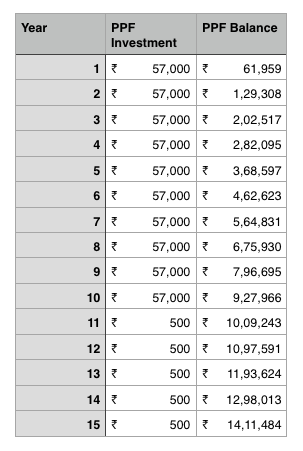 10 lakh (remember how Rs 10 lakh was the minimum in term insurance). But his PPF account is separate and all his investments will also be available for the nominee immediately upon his death. So if he dies on year 1, the amount received is Rs. 10 lakh + Rs. 61959 and on year 10 his son will get Rs 10 lakh + Rs. 927,966. Double Benefit. That is the advantage of keeping your investment and insurance separate. The logic behind this is similar to Term Insurance + PPF. Only catch is instead of immediately getting the invested money, the nominee has to wait for a 1 year lock-in to complete since the buying of the original units by his father. His kid will get both Rs. 10 lakh from the insurance company and the money he invested in the mutual fund. He could let it grow in the same scheme or switch to a different scheme if needed. How difficult to set this up? Actually it isn’t that different from starting a ULIP. You can use the help of an agent or even do most of this online. Both your term insurance and PPF/ELSS can be setup to take money from your savings account automatically. Insurance payment is done once a year, so that is quite easy. PPF/ELSS has the advantage of investing either monthly as SIP or investing in lump sum each year. Investing monthly is better as one doesn’t have to worry about cash crunch in a particular month. Rs. 4750 every month for some one who earns more than Rs. 60,000 every month isn’t a very high amount. Also SIP gives the benefit of Rupee Cost Averaging to get more units when the market is at the lows. Instead of accepting what an insurance agent (should we say “insurance seller”) says, it’s better to think on our own and see if we can get better returns. Remember “Do Not mix Insurance and Investment.” Next time someone tries to sell you an insurance policy, ask them how they can give better returns & coverage than your own term insurance + investment plan. Ask them to give in writing that their plan is safer than term insurance + PPF or gives better returns than term insurance + ELSS. I am sure no insurance agent will be able to do it. If you want safe returns: Buy a term insurance and invest the remaining money in PPF. If you are willing to take some risks: Buy a term insurance and invest the remaining money in ELSS Mutual Fund. If you want the best of both world: Buy a term insurance and invest half the money in PPF and remaining half in ELSS mutual fund. When I started on my first job, I didn’t know much about income taxes and how to save money on paying it. So I let my Dad to handle all my tax savings. There were many mistakes that were made as a result of that. Technically my dad can’t be blamed for taking these LIC policies. Because thats what he did when he started earning. During those times Life Insurance Corporation of India was the only company which provided life insurance and it was the only way to save a bulk on your income tax. That is no longer true as there are numerous other companies which provide Term Life Insurance with quite a large amount of life cover at very low prices. Spending almost Rs.45,000 per year on LIC policies to get the 80C deductions is a complete waste of money. At least my dad invested in 5 separate policies in a staggered manner (one every year) and they were money back policies. So every year one policy will return back a portion of the money invested. This reduced the amount of outgo every year, as the cheque I receive from LIC will pay a part of the premium every year. This is much better than the endowment policy which gives your money only at the end of the term. ULIPs are a very bad form of investment/insurance. It is evident with all the mis-selling that were done by the brokers and SEBI finally putting in more rules. Rs.5000 was put in a Unit Linked Insurance Policy by UTI because my dad’s friend suggested it. The amount I paid every year and the life cover & returns that I got wasn’t worth it. Both the insurances I had bought returns less than what inflations eats from my savings. Must’ve opted for term insurance and skipped all the other forms of insurances. ELSS or Tax saving Mutual Funds allow you to invest in equity and also save tax. The only restriction is a lock-in period of 3 years. I invested in about 5 ELSS funds in the end of year 2007 for a huge amount. Invested just when the market was touching its all time highs. Putting all the money at the same time. The goal I had was to save taxes – not invest the money. Investing in 5 funds is a bit too much. Especially when all 5 were ELSS funds and almost had the same goals. I didn’t diversify in the right way. Result? The returns I received was dismal. Even though NIFTY/Sensex is back to its highs, the funds haven’t reached the old NAVs. Meaning I am still in negative. Tomorrow I will write how I could have done a better job in the Mutual Funds by using something called SIP (Systematic Investment Plan). Many employees would have heard from their HR or finance department asking to give details about investments made under 80C. So what is this 80C? Let me explain with an example. Lets say you earn Rs. 5 lakhs salary per year. For upto Rs. 2 lakh, you don’t have to any tax. That means, you would have to pay 10% of the amount which exceeds Rs. 2 lakhs, i.e., 10% of 3,00,000 = Rs. 30,000. You have to pay Rs. 30,000 as the income tax for the financial year. Now lets assume you invested some money (Rs. 1,00,000 which is the max) which come under the section 80C of Income Tax Act, this entire money is now tax deducted. Meaning, you will have to pay the 10% of just Rs. 2 lakh = Rs. 20,000. You save Rs.10,000 on your tax bill. You already invested Rs. 1 lakh in some investment product + you also save an extra Rs. 10,000 (which would have gone to the government). How cool is that? Now you may ask what are the options one has to invest under 80C. Here is a list. PF/EPF – Employee Provident Fund: Employers (having more than 20 employees) should deduct a percentage of your salary and deposit in your name in a EPF account. This deduction is counted against 80C and you can use the same account even if you switch companies. All the money they put in here will grow and be useful when you retire in the far future. The best part is the interest you earn is also tax free. PPF – Public Provident Fund: Any person can open a PPF account in SBI or ICICI bank or post office and deposit money in it every year. It is useful if you work for yourself or you work for a very small company. It must be maintained for a minimum of 15 years and can be extended by 5 years after it matures. Minimum contribution is Rs. 500 and Maximum contribution is Rs. 1 lakh per year. And it earns 8.7% which is also tax free like EPF. NSC – National Savings Certificate: You can purchase National Savings Certificate from any post office or online in some banks. Period of NSC is either 5 or 10 years and it earns an interest rate of 8.5% as of today. But remember, the interest you earn through this is considered an income and will be taxed separately every year. You can however choose to reinvest it again. 5 year Bank Fixed Deposit: Banks have a fixed deposit which can be used for tax saving purpose which has a term of 5 years. It would earn somewhere around 8.5-9.5% depending on the bank. The money you put in will be locked in for 5 years and can’t be prematurely withdrawn. The interest earned is taxable. 5 year Post office Time Deposit: Just like banks, post offices too have fixed deposits called Time Deposit. The 5 year term plan has tax savings benefit and earn 8.4% interest. The interest is taxable. National Housing Bank Suvriddhi: NHB also has term deposits for 5 years which has tax benefits. It earns 9.25% interest rate and has a minimum deposit of Rs. 10,000 or multiple of it. Life Insurance Premium: Any premium you pay for life insurance can be claimed under 80C for tax saving purpose. This is the main reason people take endowment policies which has huge premiums and very little cover. But after April 1, 2013, only premium equal to 10% of sum assured will be allowed under 80C. So you can’t pay Rs.50,000 premium for just Rs. 1 lakh insurance cover. My suggestion as mentioned in a post before is to take a term insurance and invest the remaining money in the other options which earn a better return. ULIP – Unit Linked Insurance Plan: This is another life insurance product, but your money would be primarily invested in the equity market. So if the equity market performs well, you would get better returns. If not, you money can be lost. It is not advisable to invest in ULIPs as you should never mix investment and insurance. Pension Fund: There are a few pension funds (LIC or other private insurers) which can give tax relief for the financial year. This comes under the section 80CCC, which is part of the 80C when it comes to the calculation of the Rs. 1 lakh limit. NPS – National Pension Scheme: Money invested in NPS in Tier 1 scheme is deductible from Income Tax under the 80CCD section. But the aggregate deduction from 80C, 80CCC and 80CCD can’t exceed Rs. 1 lakh. So if you have already invested in other products, there isn’t much you can do here. ELSS – Equity Linked Savings Scheme: This is a mutual fund schemes which has a lock-in period of 3 years (the lowest lock-in period) that is approved for tax savings. Your money invested in ELSS funds are invested in the equity market and you would get better returns if the market performs well. It is risky, but if invested properly and in the long run it can earn better returns. Another good news is any dividend you earn is tax free and also if the market doubles or triples your investment in 3-5 years and you take all your money out, you don’t have to pay even a single Rupee as tax. Any equity invested for more than 1 year comes under long term capital gains which has no tax. Tuition Fees: If you have kids going to school or college, the tuition fees paid for their education is tax deductible. Home loan Principal Repayment: If you take a home loan, you can claim the principal paid every month for tax deduction under 80C. Do note that only the principal can be claimed under 80C and during the initial years of the loan repayment, you would be paying most of the interest. Only during the later stages you would be paying more of principal and less of interest. Stamp Duty & Registration Charges for Home: If you bought a house, you would have paid stamp duty and registration charges. You can claim this under 80C if you bought it in that financial year. You might be wondering why I am asking you to save tax rather than investing in high yielding products and becoming a millionaire. Money can’t grow suddenly, it grows slowly and exponentially if done the right way. But before that, we need to make sure that we make sure that we reduce our tax bill as much as possible. Section 80C has excellent investment opportunities which also helps you save tax. This extra Rs. 10,000 you save on taxes every year can be invested properly and earn you a nice extra money when you retire. Or you may choose to use that money to go for a trip. It depends on you. But remember, any money you can save is money you earn. Now you might think which of the following options are better? Remember, there are a few products in there which are risky like ELSS and ULIP and others which are very safe like PPF, bank deposits, etc. Also remember the returns you can earn is directly proportional to the risks you take. The first investment you should make is buying a term insurance. Lets say the premium is Rs. 10,000 for a sum assured of Rs. 1 Crore. The remaining Rs. 90,000 should now be invested in partially in risk free products and partially in risky products. So that overall the risk is mitigates and your returns are higher than sticking to a risk free product. Lets take an example: Your company deposits Rs. 20,000 as EPF and you have a term insurance with premium of Rs. 10,000. You have Rs. 70,000 to invest. You can now invest about Rs. 40,000 in ELSS, buy a 5 year term deposit for Rs. 10,000, if you have a kid you can claim the tuition fees and also claim the loan repayment for your new apartment. Overall if you add all your investments make sure you reach the goal of maximum Rs. 1,00,000 so that you gain the maximum benefit. Now you may be wondering how splitting the money into different products help you. Its called portfolio diversification and lets see that in tomorrow’s post. P.S. : Want to know why the government provides tax relief for these investments? Because these investments help growing the economy of the nation in some way or the other. Be it investing in the equity market (long term) or education of your children or building news houses – they all contribute in some way to the making the nation better. So the government gives tax benefits for these investment. P.P.S: Also don’t think of these as evading tax. You are actually saving tax and in the most legal way. Also helping to make your country better. You getting more money out of your investment is an added benefit.